In case you are just tuning in, earlier in the year (or was it last year?) Brooks over at smokingstogie.com had sent me five blind cigars to review. I had a blast doing these and he really threw in the some curveballs. 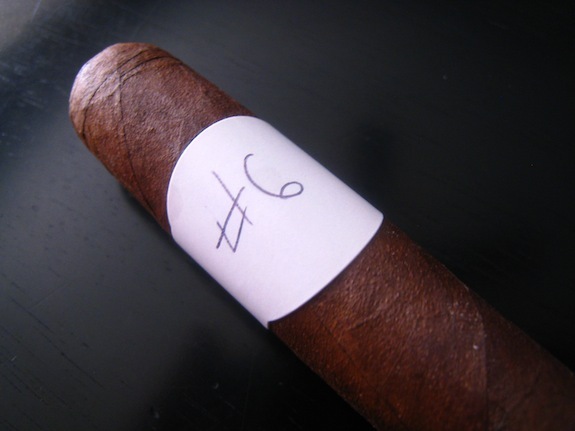 Well, he is back again sending me cigars #6 – #11 in the blind review series. If you are unfamiliar with Brooks, or Smokingstogie.com then I strongly suggest checking them out. 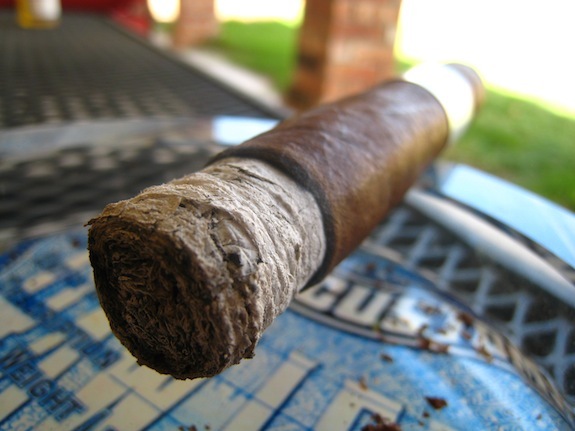 Smoking Stogie is known for doing amazing reviews and photography of some of the most exclusive, rarest, and most expensive cigars to ever hit the market. Excited? I sure am. Let’s get to this! 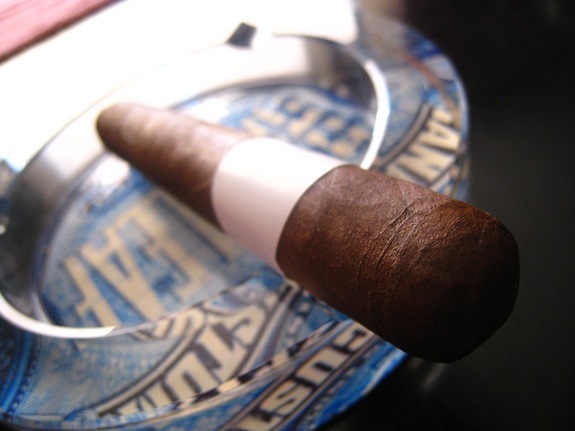 Prelight: Cigar #6 starts off with this absolutely beautiful, extremely toothy wrapper. This bad boy is oily! Bits of oil were rubbing off on my fingers every time I hold the cigar. The wrapper is a really dark, and consistent dark-chocolate brown. The construction on this cigar is immaculate. The only visible veins are very slight, and smooth. They blend so well in with the cigar they were hard to even find. 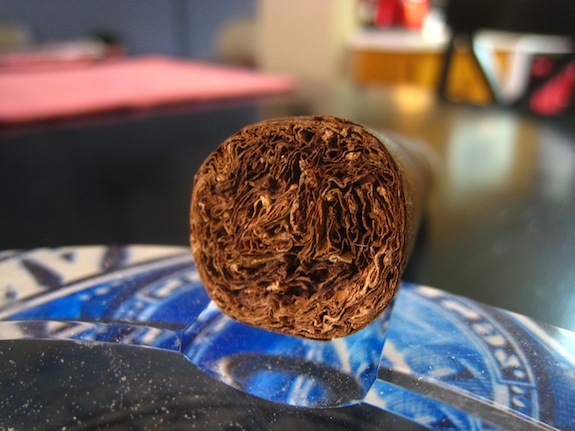 Despite how lightweight this cigar is, it seems incredibly durable with very little give heading up towards the round double cap. The wrapper of this cigar gives off a really nice cedar aroma while the foot lets loots a really, really deep spice. The cap clipped with extreme ease using my double bladed Palio cutter. The cold draw is really interesting. It starts with just a ton of pepper, spice, cedar, and some sweet raisin. Strange I know, but if the cigar bears as much flavor as the cold draw I know I’ll be impressed. First Smoke: Cigar #6 lit and toasted really quick, and really easy. This cigar starts off with a ton of pepper. After the pepper simmered down a bit the cigar’s real flavors kicked in. Starting out with a ton of cedar, some really sharp spice, sweet tobacco, and this really interesting grape/plum flavor I pulled from the aftertaste. The burline started out completely solid, and razor sharp producing a very beautiful, tightly compacted white ash. Despite the beautiful ash, it only held on for about an inch before taking a dive right into my lap. Halfway There: Going into the second third of cigar #6 and the pepper has completely faded leaving room for this cigar to really take off. The deep cedar flavor is still the main flavor backed by subtle spice, sweet cinnamon, and that strange plum flavor I pulled early into this cigar. At first, I thought the wrapper on this cigar was Connecticut Broadleaf, but the more I smoke it, the more I find myself leaning away from that. Stalk Cut Habano maybe? It just doesn’t have to same sweet characteristics that Connecticut Broadleaf normally does. Anyhow, getting back into it, the retrohale on this cigar is really sharp and spicy, I don’t find myself doing it too often at all. Not to mention the fact that I can already feel a bit of the nicotine from this cigar. Finish: The complexity of this cigar never stops amazing me. Into the final third of this cigar the pepper flavor from the start of the smoke made a brief reappearance. The main flavor is still this plethora of cedar. My mouth taste’s like I have been chewing on a black of cedar. At this point the Plum flavor is really taking off too. What a neat mixture of flavor. The body has really started to jump up as well. I am scared to get up and walk around. There was a little harshness in the end, but nothing that I didn’t mind smoking through. All in all this cigar took about an hour to take down. Probably too fast for me to call it the cigar I am about to, but that’s just part of the game. So now, for the part that makes me look like a complete dumbass. What did I think this was? 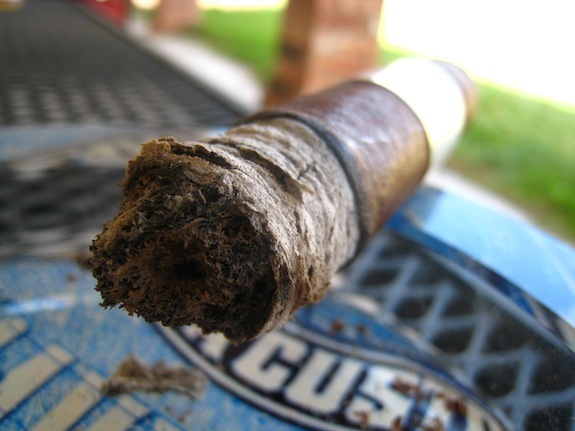 First off all, I really want to say this is a Nicaraguan cigar. It had all the characteristics, but the flavors were so interesting that I wouldn’t be surprised if there is a crazy mix of tobacco in there. 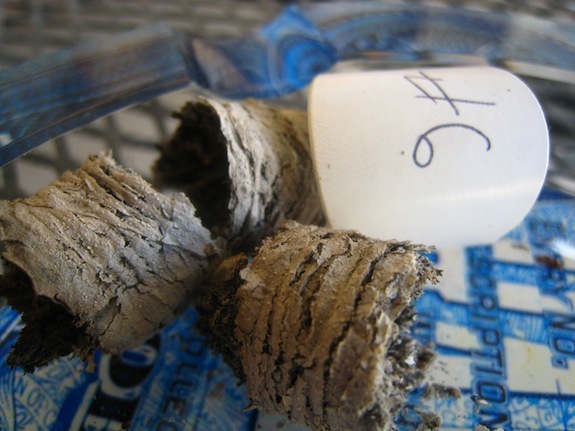 What Nicaraguan cigar did I think it is? Well, I really couldn’t get over the wrapper. It looks like something I am so used to be the experience didn’t match. That being said, my first guess is this is some crazy Liga Privada blend. The wrapper REALLY identified with the wrapper seen on the T52. The rest of the experience didn’t, but with all the experimenting that Drew Estate has been doing lately, and Brooks’ ability to get ahold of just about anything, it wouldn’t surprise me. Second guess? Viaje. I haven’t had the pleasure of smoking too many Viaje, but this is something that would definitely fit within their line. Flavorful, strong, and different. Now lets see just how far off I was. And the cigar is, Tatuaje’s Fausto. 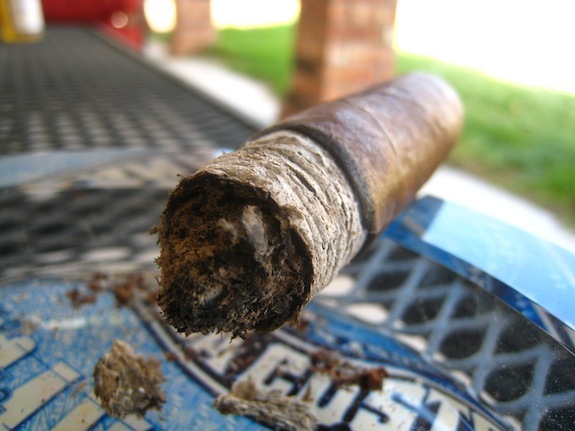 Is this cigar even out yet? Brooks doesn’t mess around. Tatuaje’s Fausto is a new blend being released this year. New blend? Kinda. If any of you remember the extremely limited T110 blend that Pete made for R. Fields in Hawaii then this cigar shouldn’t been unfamiliar to you. The Fausto is the same blend form the T110, only in different sizes. After all the success of the T110 Pete wanted to eventually turn it into a fully produced line. The Fausto is a damn strong cigar. 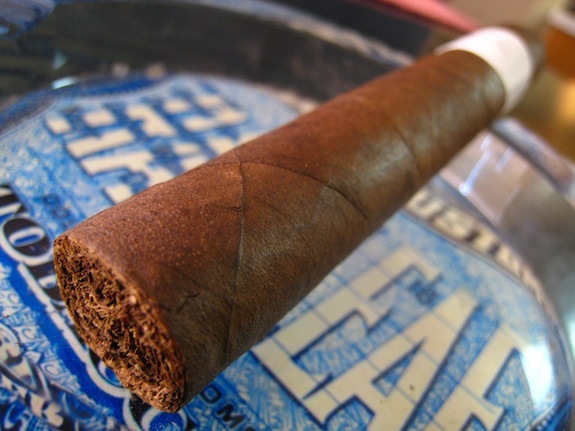 This is a full ligero cigar composed of Jalapa and Estelí grown Nicaraguan tobacco. At least I got that part right. And the wrapper? Ecuador Habano Maduro. Again, I was close! If you want to find out more about this cigar, and see a great review of it, head over to this link to check out what brooks over at Smokingstogie.com had to say about it. This is great! I love these blind tastings.You are one lucky man to be getting cigars from Brooks.No disrespect but I think Smokingstogie is the best cigar sight around. Seriously? I just drooled all over my keyboard….. That thing looks so tasty….. I love doing blind reviews as it really makes you put the effort and time into it. Awesome review. Any word on the release of these beauties? @Blane – None taken bro. We are huge fans of what they do over there too. they fill some much needed gaps and top it off by being absolutely great people. @Tadd – any day now! I’m expecting the release to be on, or before IPCPR so keep your eyes out. When is the next review? weve got three reviews coming next week. The next blind will show up either Monday or Friday. I’m not entirely sure which day yet. I still actually have one T110 left in my humidor from a group buy with Stephen Boyajian. Can’t wait until I can get my hands on Fausto especially in the different sizes. Great review as always bro. Really like the blind review concept. The T110 was soo good as I remember it. But it had been way too long since I had one, so I totally forgot what they even tasted like. I will be picking up some faustos for sure!